Take a closer look at what kinds of beverages you're consuming every day - their contents might surprise you. As we strive to maintain a healthy weight, and a normal blood sugar level, we know the culprits out there. From candy bars to cake, from ice cream to doughnuts, sweet temptations seem to be with us 24/7. Yet something as innocent as a glass of morning orange juice, or your favorite drink at the local coffee shop, can be loaded with sugar. As we quench our thirst, it's best we count those beverage calories. Dr. Leonard Bertheau, medical director and physician at Adventist Health Diabetes and Endocrine Center in Portland, said we need to watch carbs and sugar in our favorite drinks. "Consuming carbs, sugar and calories in drinks often times is an easy way to over-consume calories," Bertheau said. "It doesn't fill us up. Often times we don't really consider it as being a high-calorie consumption activity." Many people may be surprised at the sugary content in drinks. "I've had many occasions where patients were surprised to learn about how many grams of carbs they're consuming (in drinks) and how that impacts their blood sugars," Bertheau pointed out. And those carbs and sugars can be found as early as breakfast, in your cup of orange juice. "I encourage patients to refrain from juice consumption, unless, of course, their blood sugar is low," Bertheau said. "If they're having low blood sugars, it's one of the quickest, easiest ways to raise their blood sugars." Noting that juice is an easy way to take in a high amount of carbs and sugars quickly, Bertheau said, "There are 26 grams of carbs and 22 grams of sugar in 8 ounces of Tropicana orange juice. Now if you were to simply just squeeze the juice out of an entire orange, you're only going to get about 9 grams of carbs, which has 7 grams of sugar in it." With summer weather on the way, another culprit will be sugary soda. 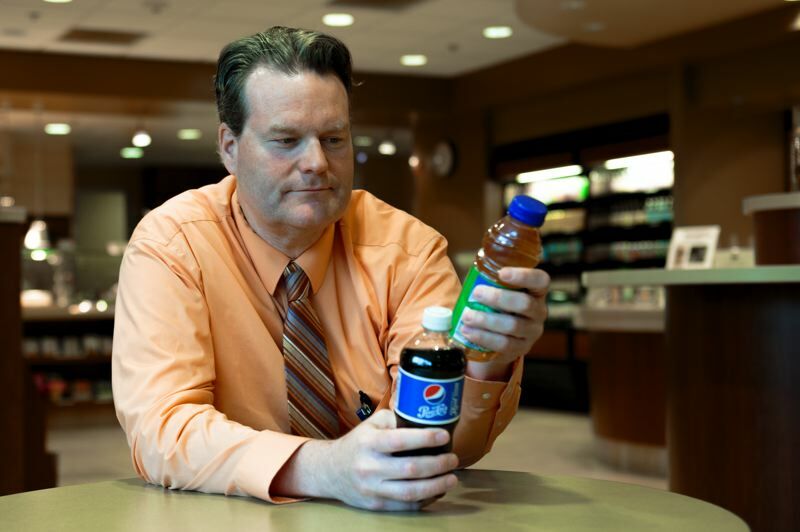 "A regular 12-ounce Pepsi has 45 grams of carbohydrates in it, which is all sugar," Bertheau said. "All of those carbs are pure sugar." Your favorite coffee shop drink may also be loaded with carbs and sugar. As an example, "Your Starbucks white chocolate mocha, 16 ounces with whipped cream and 2 percent milk, has a whopping 55 grams of carbohydrates, 53 grams of which are sugar," Bertheau said. "Needless to say that's a big shock to a patient who said that they skipped breakfast when they had, again, a meals worth of carbs in a coffee." Another thing to remember, as you choose your favorite drink this summer: Carbs. "Obviously, sugar content in products that we consume are extremely important," Bertheau said, noting it's not the full picture. "Carbohydrates are what cause blood sugars to rise." Irene Franklin, a registered dietitian with Adventist Health in Portland, said there are steps we can take to cut out or reduce sugary drinks. Among them: choose tea, coffee or water. "Most times, choosing a drink that doesn't have any added sugar is going to be beneficial for our health," Franklin said. "If you get a frappuccino every day, start getting one twice a week." As we try to watch our sugary intake, Franklin points to a food label that is scheduled to be on all products by summer of next year. "It's going to list added sugars and those (added sugars) are the ones that are really the most damaging to our diet," Franklin said, adding that naturally occurring sugar occurs in products such as fruits and milk. Sugary drinks can affect our very youngest, according to Franklin. "We are seeing more and children addicted to sugar. The best thing a parent can do is role model healthy eating," she said, adding it's a good idea to take your youngsters to the grocery store and teach them how to check for sugars on the food label. Then there's this sobering statistic about our kids: Bertheau said, "There was a posting from the Harvard School of Public Health that states 1 out of 3 children in the United States are overweight or obese. That's a lot." Drink water. After you refrain from high-sugar drinks, eventually water tastes really good. Diet drinks are not a good option, since cravings can still be high with diet sodas. Consumption of artificial sweeteners can contribute to weight gain. Add a small amount of lemon, lime, strawberries or cucumber to your ice water. If you drink large amounts of soda, it might be best to gradually taper off the sodas until you can quit. High fructose corn syrup in beverages should be avoided. Look at the nutrition label on products to check for sugary content: Look at calories, carbs, sugar and high fructose corn syrup. HOW MUCH SUGAR SHOULD YOU GET? The American Heart Association (AHA) recommends limiting the amount of added sugars you consume to no more than half of your daily discretionary calories allowance. For most American women, that's no more than 100 calories per day, or about 6 teaspoons of sugar. For men, it's 150 calories per day, or about 9 teaspoons. The AHA recommendations focus on all added sugars, without singling out any particular types such as high-fructose corn syrup. For more detailed information and guidance on sugar intake limits, see the scientific statement in the August 2009 issue of Circulation, Journal of the American Heart Association.